H.Upmann is one of the most prestigious Habanos brands. The blend of the brand, characterised by its aroma and mild to medium flavour, is made with selected leaves of the best crops of Vuelta Abajo, Pinar del Río, the most renowned tobacco region in Cuba and the world. The excellence regarding the quality of its cigars is shown in the gold medals of the H.Upmann boxes, that certify the prices obtained in no less than eleven international exhibitions during the 19th Century. 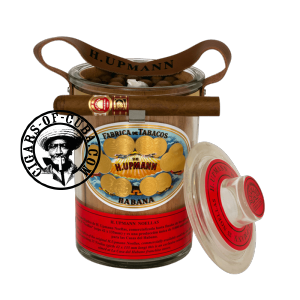 Within the Upmann portfolio well known sizes such as the Sir Winston, Magnum 46 and Magnum 50 stands out. For full enjoyment of those devoted to the brand, Habanos, S.A. offers the possibility to revisit the past through this attractive presentation in glass jars thus reviving the original that was produced until the 80´s in the 20th Century. Its production limited to only 5000 jars containing 25 Noellas each (Girth 42 and 135 mm long) results in a very exclusive item for those who looks for perfection. Appealing to connoisseurs who prefer a light to medium smoke unmistakably found in the brand, this beautiful jar will be available in the next weeks in the La Casa del Habano stores worldwide.